Hi, this is François, one of the the book’s authors. I wanted to thank you for this review, and to write a few notes about your remarks. About the bugs in the source code, be assured that we tested all the examples provided. But despite the numerous rereadings (and maybe because of it), there are always typos left in the final book. That’s also one of the greatest advantages of having the book available online for free: we can keep on correcting it even after the paper book release, and provide an accurate and up-to-date documentation. If the book sells well, be assured that the second edition will correct all the bugs we’ve spotted so far. Thanks again for your comments, and welcome to the symfony community! Thank you for your feedback on the review. Regarding the Generators chapter: I was repeatedly finding myself taking the default table based scaffolding and rewriting it to use labels and divs. So when I came into the Generators chapter I was hopeful to find some way to make this change once and for all. But I certainly understand that space is limited. Ironically enough I had a longer explanation about the Generators bit in a first draft of the review, and I cut it out to keep the review below 1,000 words. Either way, thank you for a well written and easy to read book! I do wish more technical authors were as down to Earth as you and Mr. Potencier. Thank you for the kind review. As the book’s editor, and Apress’ Open Source Editorial Director, I wanted to offer some thoughts regarding our sale of the e-book despite it also being available under the GFDL. As you might imagine, both the authors and Apress poured considerable time and resources into the book, and clearly note the book’s availability under the GFDL. Accordingly, should readers be interested in supporting future works of this nature, we invite them to purchase either the print or electronic version (or both). There’s certainly nothing odd about it; it’s just another way to support both authors and publishers who choose to license their work under open source licenses. Hope this helps to clarify our intentions. 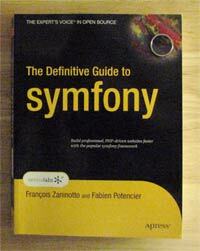 I found this book an excellent resource as someone who needed to learn and use symfony in a very short space of time. It provides the reader with a solid understanding of the framework on which to build. The fact that it doesn’t offer any example application tutorials is fine as it encourages you to get involved with the online community to seek examples, ask questions and learn more. No doubt subsequent books on the symfony framework will offer complete application tutorials and walk-throughs. “The book can be used both as a primer and as a reference for a person who is not yet a symfony expert”. I’m sorry to hear that you have experienced roadblocks. I do believe your situation is not typical however as I’ve had a great deal of success with symfony both within WireLoad and outside of it. As with every software project, there’s going to be a time when you have to go off the beaten path and figure things out that haven’t been fully documented or developed yet, but none the less, every key feature that is needed for a modern web application is right there and easy to use in symfony. I hope that whatever ails your software project can be cleared up on time. Good luck. rihad, i think your argument would be more convincing if you’d refrain from swearing and give a couple of examples to back up your accusation of ‘lying’. also, to be honest i can’t imagine these guys lying about much… they’re talented people and seem to have integrity.